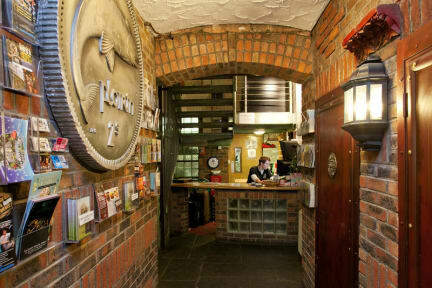 Our hostel offers affordable, central, clean and fun accommodation in the best location in the city! Not only are we budget-friendly but our hostel is part of the famous Oliver St John Gogarty's Irish Bar - the only hostel in Ireland to have a bar on-site! 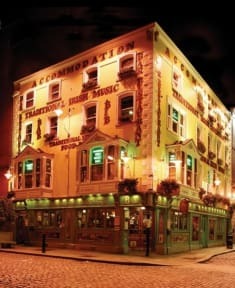 If you feel peckish, Gogarty's pub serve traditional Irish meals all washed down with the best Guinness in town! Live music is played daily so hostel guests will be entertained from dawn until dusk! All our rooms and dorms are ensuite; we also have a fully-equipped kitchen with a dining area so you are free to prepare your own meals each day. We like to make this a home-from-home so we offer free continental breakfast, free tea and coffee all day, great common areas, laundry facilities and all the basics for hire, not to mention a 24-hour reception and no curfew! Most tourist sites are within walking distance and we offer discounted tickets to some local attractions. Discounted car parking is also available at Fleet Street Car Park! Temple Bar itself is a network of narrow cobbled 18th-century streets between the River Liffey and Dame Street with Oliver St John Gogarty's right in the centre. Gogarty's consists of three bars and has a restaurant on the top floor, so as soon as you set foot outside the door of the hostel you can immediately feel and hear the electric buzz that is Temple Bar. Gogarty's Hostel is located in one of the busiest and most popular areas of Dublin City Centre and is ideal for all you party animals who are looking for fun and excitement!!! Gogarty's Hostel is group-friendly and if we can't fit you into our hostel we have self-catering apartments, too, which are perfect for any group! Amazing location next to a cozy pub, nice and helpful staff. Do bring you earplugs of some sleep. Because you are in the middle of the party center of Dublin. We had a very nice stay. Good location. I would recommend this hostel to my friends. Breakfast simple but good. The staff was helpful, but not very friendly and enthusiastic. Our room was pretty dirty when we entered it. The floor was very dusty and the ensuit was pretty filthy. One day we ran out of toiletpaper and there we could only get a small roll from the staffs toilet... Very uneasy. Wifi was good, breakfast was also good, but the dining area chairs where not clean at all. Overall an okay experience, but I don't think I'd go back another time.